I do not watch much television, let alone reality shows, so I was a bit nonplussed when the Swamp People, Music Inspired by the TV Series CD showed up in my mailbox. I am not familiar with the show and figured that it would be a compilation of mood music and kitschy dialogue from the show. I was wrong – this disc is chock full of first-rate blues, country, Zydeco, bayou, soul and roots music. In case you are in the same boat as me, Swamp People is a reality show that has been broadcast on History since 2010. The show follows groups of Cajun alligator hunters as they ply their trade in Louisiana. It is quite a hit for the network, with millions of viewers for each episode. Who knew? The songs on Swamp People, Music Inspired by the TV Series are not really derived from the show, but instead fit in with its theme. There is only one original track (the theme song, “Swamp People”), and most of the rest of the collection pre-dates the show, sometimes by decades. There are famous classic recordings mixed in with more obscure new music, and it all fits in well with the premise of the program. The title track, Steel Bill’s “Swamp People,” is the newest song of the bunch and it was written specifically for the show. Its country rap stylings and lyrics remind me of what Kid Rock has been doing for the past decade. It will probably not become a classic, but Billy Joe Tharpe did a good job of making it match up with the subject matter of the show. The other king, Hank Williams, makes an appearance on Swamp People, Music Inspired by the TV Series. This CD would not have been complete without “Jambalaya (on the Bayou),” his 1952 country hit. There have been so many covers of this song that it was refreshing to hear his original again, which adds a bit of Cajun flavor as he recounts the life of partying and eating in the Louisiana style. If this song is not in your library, you are missing out. One song that I never saw coming was The Neville Brothers’ “Fire on the Bayou.” I had not heard this 1981 soul/funk piece in the longest time, and it features the tight back line and beautiful vocal harmonies that these gentlemen are known for. The Neville Brothers are native sons of New Orleans, making the inclusion of this hit all the more appropriate. A couple of neat instrumentals were thrown into the mix, too. Buckwheat Zydeco’s “Zydeco La Lauisianne” has a frenetic party pace and some lovely accordion work, and Amanda Shaw’s “French Jig” is full of fantastic Cajun fiddle. This young lady is one to watch, as her singing is just as good as her violin playing. Though she is only 22, she has already released four very good albums, and we will be seeing a lot more of her. The album finishes off with an obvious choice, “See You Later, Alligator.” But instead of the popular (and predictable) Bill Haley and the Comets version, they went with the original performed by Bobby Charles, who is the man who wrote the song in the first place. Charles’ original is in the New Orleans blues style with some nifty drum work, and I prefer it over Haley’s rock and roll cover. To me, this is the standout track on this project. 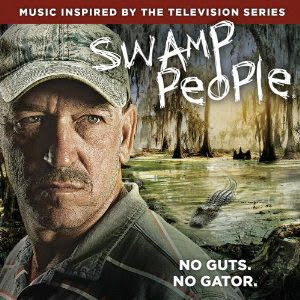 So, do not judge Swamp People, Music Inspired by the TV Series by its title or by the show that inspired it. If you write it off because you dislike the show you will miss out on a fabulous amalgamation of Southern music. This stuff was recorded by the best the business has to offer over the past 50 years, so check it out if you get the chance!